Gov. 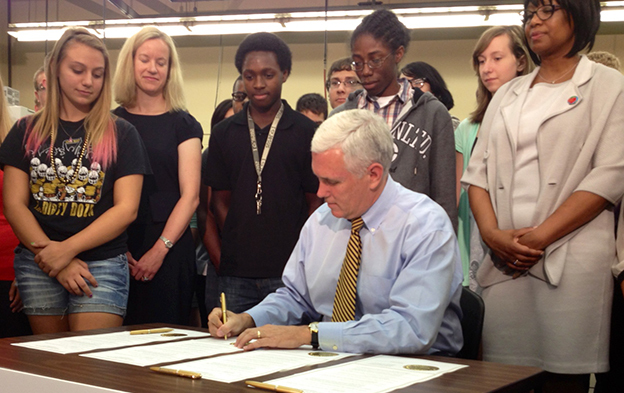 Mike Pence signs an executive order creating the Center for Education and Career Innovation. In August 2013, Gov. 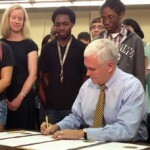 Mike Pence announced the creation of a new state agency, the Center for Education and Career Innovation, to align the state’s workforce development efforts under one roof. But at least one stakeholder felt left out of the loop — state superintendent Glenda Ritz, who said she didn’t hear about the governor’s plan until just before Pence announced it to the press. CECI is the new home of State Board of Education staff, a move that’s led to ongoing tension between Ritz’s office and the new agency. Claire Fiddian-Green, Pence’s special assistant for education innovation, says it didn’t make sense for the Department of Education to continue to act as fiscal agent for the State Board because their responsibilities come from a different place in Indiana code. “I think there was a misunderstanding that somehow the creation of this center was taking something away,” Fiddian-Green tells StateImpact. Fiddian-Green co-directs CECI with Jaclyn Dowd, the governor’s special assistant for career innovation. In total, 16 employees work for Pence’s new agency, including policy and data experts, directors for the State Board and Education Roundtable, a spokesman and lawyers who advise the State Board. Who’s Leading On K-12 Education Policy? The creation of CECI has resulted in a very public battle for control of the state’s education agenda. By statute, the elected superintendent chairs the State Board of Education. And Ritz has struggled to find common ground with other board members, who were appointed by the governor. What started as squabbles about the agenda escalated in October when the 10 appointed board members signed a letter asking legislative leaders to intervene in the calculation of A-F letter grades. Ritz sued the rest of the board, accusing them of violating Indiana’s Open Door Law. That suit was later dismissed on procedural grounds. But the tensions didn’t end there. A month later, Ritz walked out of a State Board meeting after refusing to recognize a motion she felt was improper (the Attorney General has since ruled it was OK). She says the ongoing problems are the result of the CECI trying to undermine her department. At issue is who should lead on education policy in Indiana — the elected superintendent, or the governor. Recently, Pence encouraged the State Board to bring in a national group to help mediate the ongoing tension. But board members couldn’t take any action at the orientation session because adequate public notice wasn’t given. State superintendent Glenda Ritz, CECI employees and the State Board of Education will meet Wednesday for the first time since Governor Pence dissolved CECI. Even though the governor disbanded his education agency, the group’s responsibilities live on. We break down how they’ll be divvied up and who takes on what. Now that Governor Pence has announced the elimination of CECI from Indiana’s education scene, let’s take a look back at the history of the agency. Now that Governor Pence has eliminated his education agency, will the State Board of Education be able to get along and accomplish work for Hoosier students? 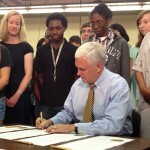 Governor Mike Pence is signing an executive order Thursday to dissolve his education agency, the Center for Education and Career Innovation. Considering how frayed relations on that panel have become, Friday’s State Board of Education agenda is a minefield. A policy document from the Center for Education and Career Innovation floats the possibility of removing Glenda Ritz as head of the State Board. Ritz and Pence want the National Association of State Boards of Education to help defuse tension on the State Board of Education.